Other Fedcon films are listed at the bottom of this page. Digital Ghost Rating: 3.5 to 4. Runs 22-25 minutes. The quality of the sound and video is very good, but the writing was midling, and the acting didn’t make up for it. It was a good basic idea, particularly given the increasing movement toward automation in real space exploration. Digital Ghost examines the problems of a fully automated ship. It is not clear, however, what purpose the ship was to serve. The execution here was unconvincing and predictable at the same time. The human interaction was more unconvincing than the technical interaction. 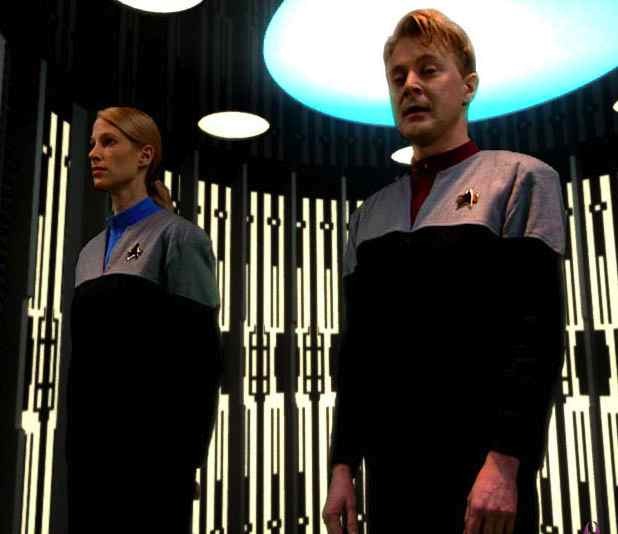 The two Starfleet Officers, the nerdy man, a Commander, Stanley, and the supermodel-like subordinate woman, a Lieutenant, Odyssee, would have been believable if they were not supposed to be romantically attracted. To be fair, even professional Star Trek handled sexual relations poorly. At best this was an unabashed fantasy about a very ordinary, self-important, not very bright, and whiny male officer being fought over by a supermodel and an equally beautiful hologram. Again, if Stanely were supposed to be very powerful, not just Odysee’s direct superior officer, the story could have been believable, ... if it had been supported by the acting. However, while good at most of what she did, Odyssee, did not appear to be attracted to Stanley. Nor did Odyssee appear frightened or disoriented enough to suddenly fall into the arms of the man who contributed to the danger by belittling her concerns at early in the story. Like many fan films, the casting director confused a female’s beauty with her acting ability. I also found the equation of the artificial gravity toward the end with life support, which it was not attached to at the beginning, a minus. The space pirates were unconvincing. The notion that they could count on the rescue ship not raising shields and being able to take it over, absent an ‘insider’ working with them to program the ship to make errors and to give them the codes in advance to be ready to hack in was unlikely. If they had that level of massively superior computer power, they would have something so valuable to trade that the piracy would not have been their most lucrative choice. Also, the reason for the ‘Abraxer’ instead of just relying on the good ole Orion syndicate was unclear. Was it ever established in TNG that the Orion Syndicate had been rooted out? I thought I remembered some DS9 episodes in which it remained in operation. And I know it appears in Hidden Frontier. On the other hand, the story was well edited, moved right along, and made a good video case against fully automated weapons systems... although I’m not certain that was the point intended. Every internet computer user is aware of spyware, and of the ability of another person to take control of a computer which is on the net from a remote location. People have hacked the Pentagon systems, and I see no reason to think automated drone bombers... or even intelligent ICBMs... could not be hacked into unloading their bombs onto the people who sent them up, just as this ship could be used against the Federation if it were taken over. The CGI and other special effects were adequate. They added, and did not detract, from the story. I read some objections to the green screen work here, but I believe the simplicity of it was appropriate for the story. Finally, the closing makes this into a commercial for Fed Con, a German Star Trek convention, with the nerdy guy losing his ticket and the hot girl going ‘without him.’ This diminishes the technology point of the story. This was the most important point which made this story require more suspension of disbelief than standard Trek. A small ship goes by and approaches a vessel which resembles the TNG movie era Enterprise. The team is called to duty by Jean Luc Picard, offscreen. We see two people, both blonde, a nerdy looking man and a very beautiful woman. The man’s name is Stanley, a Commander, and the woman is Odyssee, a Lieutenant. . 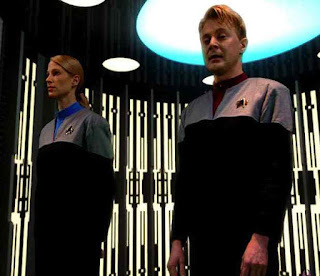 They are wearing TNG movie-era uniforms. Odysee expresses a problem with the whole idea of a fully automated ship from the start. The two transport over to the new “High Class” fully computerized ship. The artificial gravity is not on. Odyssee, objects. The computer there turns it on, explaining in a female voice that it was not needed in a fully automated ship. The computer addresses the two as “gentlemen’ which the male officer, Stanley, doesn’t mind, but Odyssee is offended. The computer announces that the turbolift has arrived. As they ride, Stanley suggests to Odyssee that they get to know each other better over a candlelight dinner. Odyssee is pleased. Odyssee objets that the ship is impersonal. The ship produces an attractive female holographic imagine which asks it be called, “Roxanne”, so it’s more personal. “Roxanne” says the tests will begin in a few minutes. Odyssee comments that that is imprecise for a computer. Stanley says Odyssee is prejudiced. Odyssee says that the whole idea of a fully automated ship is offensive. What’s it’s good for? It’s to replace us! Stanley says it has already replaced us. The ship needs no navigator. They have to run tests, then give an unprejudiced report to the commission. Odysse says, ‘As you wish, commander,” and walks away. She comments that such an outfit belongs on the holodeck, not the bridge. She looks at a 3D imagine of the ship in space floating in front of her. Roxanne says the ship is ready to go. Odyssee says they are moving too fast. “Roxanne” says, “Speed factors have been calculated 423 million times.... There is no other data. Stanley: All parameters are positive. Roxanne reports receiving a distress call from the Perigon Sector. The signal is distorted, and ‘she’ can’t identify who is sending it. The ship redirects itself to the Perigon sector. Roxanne: We are not going to avoid the asteroid storm. Roxanne: As observers you are not in a position to order the High Class on navigation or tactics. Odyssee: She will kill us. She hasn’t even raised shields. Roxanne: Shields aren’t required. The are an unnecessary waste of energy. Please sit down and enjoy the flight. (She points to the floor, there is no furniture, but a seat rises out of the floor). Odyssee: A computer who offers us a seat (approving.). She could have offered it earlier. Both humans sit. The ship navigates through a dense asteroid field. Odyssee is impressed, “She can do more than I thought. Roxanne’s eyes flash blue, and the ship goes to warp. Roxanne notes that they are appraoching a Beta Class ship of the Abraxer people. Roxanne: Traders, not members of the Federation. Stanley: OK, Approach and energize the tractor beam. Roxanne: I have already informed the Abraxer ... engaging tractor beam to the ship. Stanley: Shouldn’t we engage the shields? Roxanne: No signs of danger. Roxanne: Would you like a tranquilizer from sick bay? Roxanne: The database has be reviewed 423 million times. Stanley: “I never heard anything about these people before.” He runs a tricorder scan. “Roxanne, which sectord o the Abroxen come from? Odyssee: Traders? How do they make their living? We see the Abraxer shoot at the High Class. Roxanne is paralysed. The ship is hit repeatedly and she does not raise shields. We see a pciture of a heavily armoured species. Roxanne: The Captain of the Abraxer says we should surrender. Our warp dirve and shields are inoperative, only our tractor beam still works. According to Starfleet procedures, we should quickly surrender the ship to avoid more damage. Stanley: That is not an option. We are not going to give the Pirates our ship. Stanley: Roxanne, using authorization code 7134B I am taking command of the ship! Odyssee: Stanley, what do we do now? Stanley: I am afraid we have to eliminate her. The Abraxer arrive on the ship. Odyssee tries to phaser the hologram, but he phaser bounces off a force field and knocks her down. Stanley helps her up. (It is not clear why phasering the holographic image would do anything whatsoever to the underlying computer). Roxanne: It is not permitted that you destroy the ship! Roxanne: That is not currently possible.. An Alien module has been located. The ship security has been compromised. Odyssee: Careful, Stanley, she’ll switch off life support. Stanley (floating) She already has! Stanley orders Roxanne to eliminate the alien module, and she responds that she will do so in five minutes. Stanley demands she turn life support back on, and they fall to the fall as she does. Odyssee shoots Roxanne with a phaser again, but this time she is not shielded and the phaser throws Roxanne into electronic instability. Her image waivers. Roxanne: I am eliminated 60 per cent of the module. 40 per cen I cannot eliminate without self-destruct. Self-destruct in five minutes. I hope I have passed your tests. Roxanne then disappears. Odyssee: You have passed, Roxanne. Stanley. : Whatever the Abraxer have done, it’s gone now. I’ll take manual controls. Chairs raise from the floor. Stanley gives Odyssee an order, which she attempts to do. He then turns the ship around and heads for the asteroid ‘storm’. The Abraxer fire at him. Shields are down to 55 per cent. Self destruct in 3 minutes. The tractor beam is still on as the Abraxer fire and they enter the asteroid field. The countdown continues and the shields of both ships hit asteroids. Odyssee is worried, but Stanley assures her that the Abraxer won’t destroy the ship, they still hope to take it. He orders her to hail the Enterprise. Odyssee gets no response. They place three objects into the transporter and they and the objects appear on the surface of an asteroid. The objects project a field with an atmosphere inside it, and they transport inside the force field the objects produce with an atmosphere (and heat?). The Abraxer hit the asteroids and then turn to fire on the survivors as the ship explodes. Odyssee: We will not live until tomorrow, I was looking forward to that candlelight dinner... She grabs and hugs Stanley. The Enterprise shows up and chases off the Abraxer ship. It is destroyed when it hits and asteroid. The two are transported onto the Enterprise by the same officer who transported them off. Stanley: Roxanne was not fully developed. Odyssee: Do I hear prejudice? We see a shot of the asteroid with Stanley’s ticket to the “FedCon” Trek convention floating in space. Fedcon 25 (2016) From USS Danubia, their first Star Trek Fan Film, German fans speaking English creating a Silver Age Star Trek Fan Film which uses elements from Star Wars, "Force Contact," https://youtu.be/W7UKlPpXb1A (28:51). (German subtitles). Released October 26, 2016.